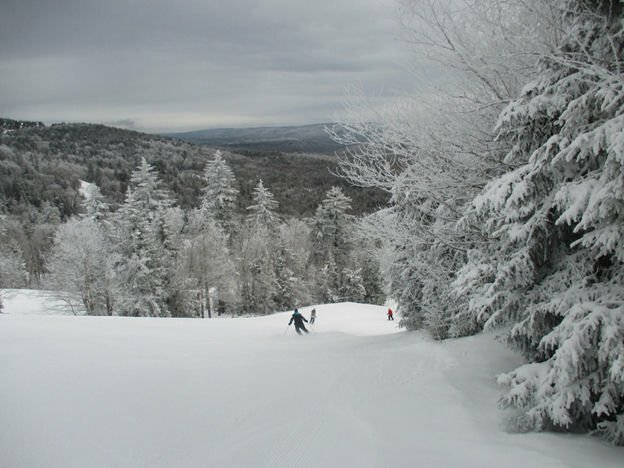 The early part of this ski season was so bad we will still shudder when we tell our grand children about it as we drop marshmallows in their cocoa in better Decembers to come. However, the value of the investment most resorts put into snowmaking infrastructure became apparent when 2016 and colder temperatures finally arrived; basically, that saved our post-holiday season. What would have been a catastrophe became salvageable and ultimately there were consistently reliable conditions throughout the region. 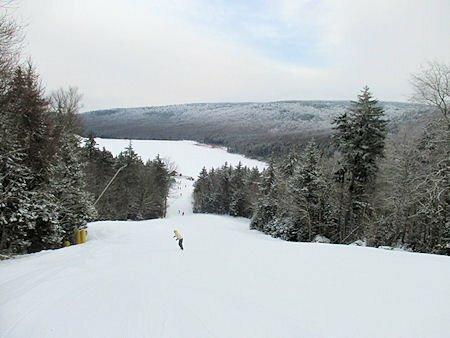 A lot of us took full advantage of that coverage last weekend at the SkiSoutheast Snowshoe summit. Every run but for one at Silver Creek was open and in excellent shape, firm and fast, while a couple of light accumulations kept things soft on the edges. First descents were had on Sunday morning thanks to Snowshoe giving First Tracks to our group. It was a blast and although the trees were not a viable option the corduroy was perfectly laundered and ready for sweeping turns and swift descents. Still and all, the fact is that my attention is only held so long by these conditions, I love seeing old friends and regulars, meeting more each time, and can keep amused trenching wild GS turns on my soft , oversized and utterly inappropriate powder skis (my theory is, “If I wear them, it will snow.”) I can and do love all that but I need more and as the sun goes down the slopes light up and I’m looking forward to a long finish and sometimes the best part of my ski day. 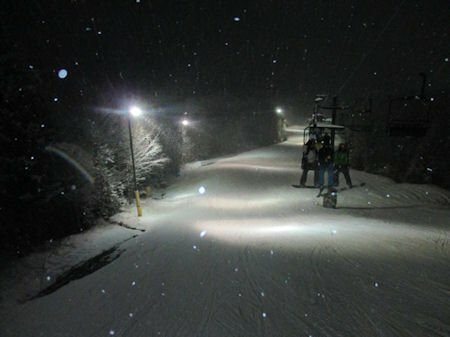 It’s a strange phenomenon, even though the slopes are the same there is something about the night and the spread and glow of the sodium lamps that makes the runs feel and ski differently from how they’ve skied all day, it’s new mountain, a bonus time with a unique energy . 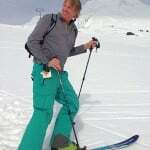 Some of my VERY best hours of skiing have been the after-hours. There are shadowy pockets along the edges and between the pools of light that have a thrilling uncertainty, you are never in the dark but it’s altered and a little mysterious. If it is snowing or overcast the glow of the light spreads through the air, and what in daytime might have been flat and poor visibility in the middle of the trails, at night seems to have a substance that brings out the contours of the terrain. It’s a playground of shadow and light. Comrades of the night. There is also a change in the personality of the slopes. There is a certain mischievousness to it, like you are all getting away with something. “Hey everyone, check it out! They forgot to stop the lifts, let’s keep skiing till they throw us out.” And speaking of lifts, while I admit I’m usually too giddy, and sometimes too cold, to pull out a timing device, I am convinced that they turn the lift speed up to 11 at night; the lifties are really having to swing back those chairs on the fixed grips, and for that I say double thanks to you toilers of the night. Get your second breath. I may be tired and cold but once I’ve made the effort and stepped into that magic light, I have never regretted a night session. In the case of Snowshoe (where I have skied the most at night) you take a bus from the main village, if you are not already staying at Silver creek, and there is usually a festive air on board that carries onto the slopes. Take a ferry from England with workers heading home to Dublin with London wages in their hand, or sit in the middle of a van overfilled with 12 year olds out of school and on their way to summer camp; I’ve ridden the night bus when a similar air prevailed. Which does bring me to a caveat, in some cases your fellow skiers may possibly have imbibed a few, the whoops are a little louder and sometimes the skiing more reckless and while this is worth noting I would also say that the crowds are lower and there’s enough room for all sorts. So if the apres party has commenced I’m alright with that. 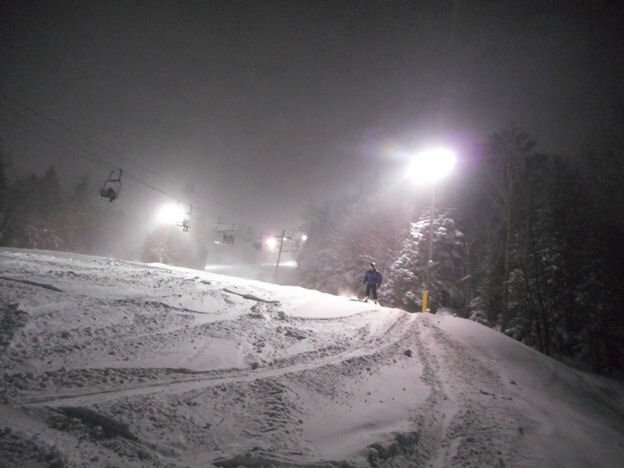 The South, Springtime and Night Skiing. 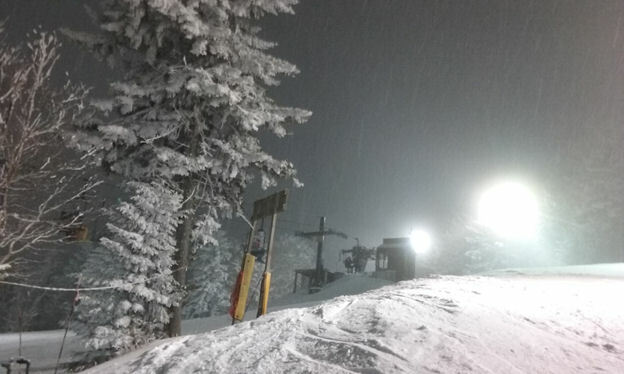 Like the snowmaking infrastructure, the labor and lights necessary to keep things going after dark is something the Southeast ski resorts have embraced and it’s one of the few places we outshine the West. While it can certainly be damned cold mid-winter that is less true now as we move into spring making this a prime time to go out when the lights come up. Even when Mt. Snowcone is getting sloppy by late afternoon, it will firm up again at night as long as that heroic base holds out. 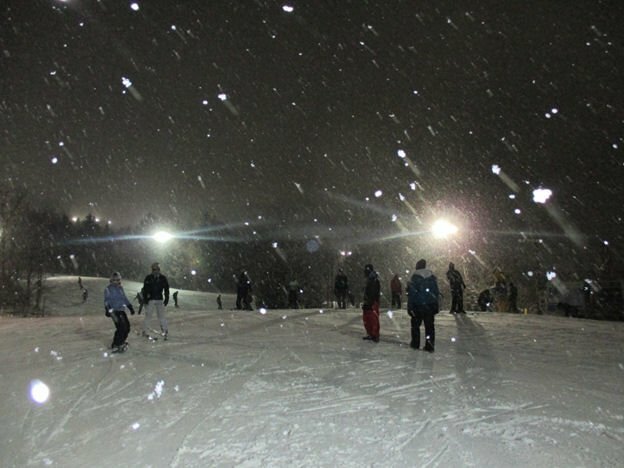 Among the areas that intend to keep the lights on nightly through the rest of the season are Snowshoe, Beech, Sugar, and Appalachian (double check when making plans) and most others will continue to do so on the weekends that remain. Need I add that low prices now prevail, with the temperatures in the sixties some tickets are now in the twenties. While available days are becoming numbered, our season isn’t over yet and this can be a special time. Don’t look back in August with sour and rotten regret over squandered opportunities, go and wring every hour out of each remaining day. What, you’d rather start mowing your lawn?